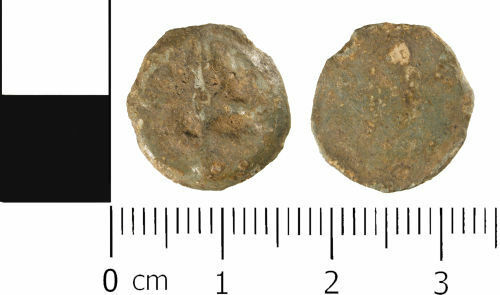 A complete lead alloy unifaced token, of Medieval to Post Medieval dating (AD 1300 to AD 1600). The token is sub circular in shape. The obverse depicts a raised long cross design with a pellet in each quarter (Powell type 14). The reverse is plain and undecorated. The token has a diameter of 15.3 mm, and is 3.0 mm thick. It weighs 3.6 g.